SnotNose: seems to do the job. is the trickiest reply I could find. 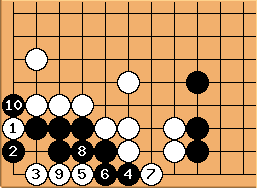 Black has no good answer to . is a key move. 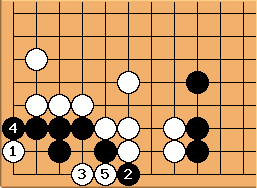 If at then Black can play at to get a seki. 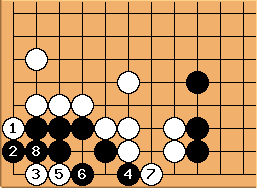 DomQ: I thought that Black 2 was a successful defense for Black after White 1. This is not the case. unkx80: The descent at is the way to kill, much like in Beginner Exercise 72 and Beginner Exercise 76. After that, we can say that a and b are miai. If , then to kills. 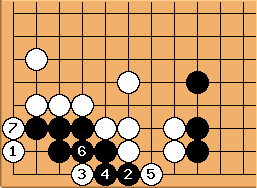 If White (improperly) tries to kill off the (false) vital point (was Black 2 in the above sequence), here is the correct answer for Black. unkx80: Black should play at here. 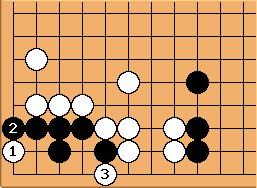 Since capturing at a gives Black one solid eye, White can do no better than to turn the corner into a seki, that is, Black is already alive. EricBackus: My first thought was There is Death in the Hane. 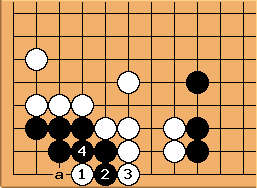 I guess this is mostly similar to the first solution given above, but it seems somehow simpler to me. 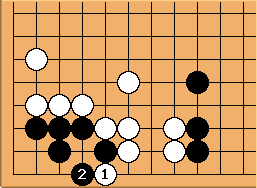 I don't see a possibility of messing up and getting seki, for example. 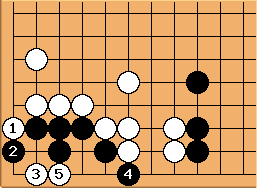 So, is this a solution or am I missing something obvious? 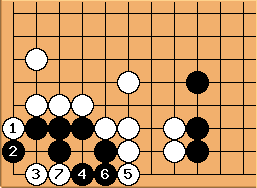 When we use the move at , given in the original diagram as the trickiest response, black can live like this. 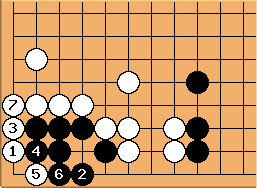 So now white can only try to kill by playing at , after which white kan get ko by playing at himself. Rich: How does black live from here? Doesn't shortage of liberties prevent him from connecting out? 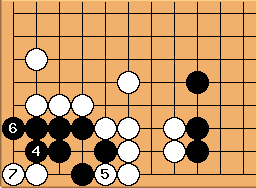 Black can get ko, which is basically the same ko he can get two diagriams earlier by playing at , but with less ko-threats for white. VanEvery: I don't see Black making two eyes with this corner since this robs Black of his eye shape. Any thoughts? unkx80: Black makes ko with .